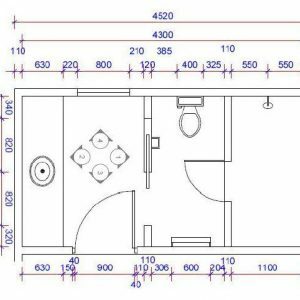 Many of our clients use Autocad LT to draw up floor plans for bathrooms and kitchens. In our Autocad training courses we customize each class but a brief description of the process is as follows. First of all, open your own Autocad template, or use any of the ISO templates which ship with Autocad (Application menu – top left – New Drawing). ISO stands for International Standards Organization, and is basically a metric template. It’s pretty basic though, and only really ensures that your scaling is metric. It’s best to modify this for your own company by adding text and dimension styles, as well as your company details and logo to the paper layouts. It’s a good idea to save it early on, so go back to the Application menu (Mac: File menu) and choose Save As: Bathroom-floor-plan-01. It’s also good to add a number at the end of the title, making it easier to track versions later on. To create the bathroom walls select the Rectangle tool (or type REC > Enter). Select First Point: 0,0 > Enter – this is Autocad‘s Zero Point, or Origin Point. Many drafters will use this point in order to align floors of a building, for example. Next Point: type in 4520,2520 > Enter – this establishes the adjacent corner of the rectangle. Both the cursor and Command Line are now empty, waiting for you to type in the next command. So this is the footprint of the bathroom. Roll or double-click your mouse-wheel to zoom out if necessary – this is called Zoom Extents. Now select the Offset tool (or type O > Enter) and type in the wall thickness, for example 110 > Enter. And click outside or inside the rectangle, depending on whether the initial measurements were interior or exterior dimensions. And hit the Enter key to close the command. First make sure that Ortho is on at the bottom Status bar. Next select the Line tool (or type L > Enter), and hover the cursor over the top left corner of the room (for example). We then pull the cursor to the right side (X-axis) and type 850 > Enter. Pull upwards in the Y-axis and click on the Perpendicular – this creates the first part of the window opening. We can then choose the Offset tool again and type in the width of the window (in this case 800 > Enter). Repeat this with any door openings, for example hover over the bottom left corner of the room with the Line tool, then pull to the right and type 780 > Enter. Offset this line to the right by 900 > Enter. Internal walls are drawn in the same manner, for example 1860 from the top left, downwards by 1150, across by 120mm and back up to the perpendicular. Joinery is also drawn using the same method. 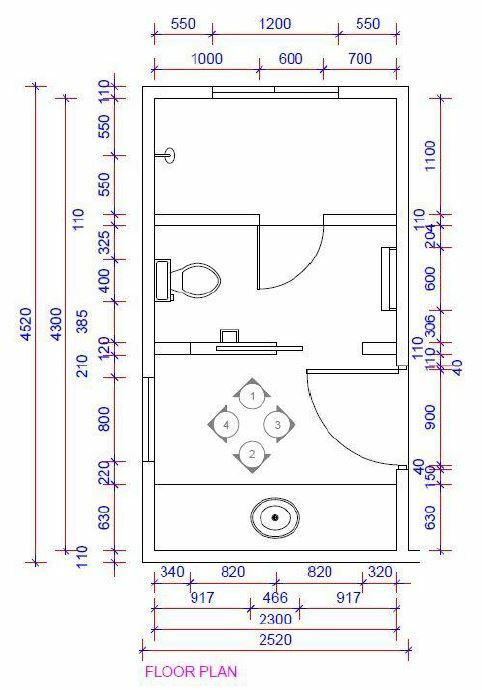 Autocad blocks are used for any repeated items, in this case doors, windows, sinks, bath, toilet. Blocks can either be created from scratch, copied from other drawings, or downloaded from the internet (for example manufacturers’ websites). See our other blog posts for more information on blocks. Text and dimensions are then added – you can have these on a separate layer, in order to turn the visibility on and off as desired. See our other blog posts for more information on adding these to a drawing. The last step is to go into Autocad‘s paper space and scale the drawing to the view-port window, add our own text to the title block, and export the drawing as a PDF to email to the client. To do this double-click on one of the Layouts at the bottom of the interface. If you have used a good template the title block will be easy to edit. Double-click inside the view-port window to adjust the position of the drawing, followed by the scale at the bottom right of the screen – this is a pop-up list showing for example 1:100 or 1:50. If this reveals a list of scales showing feet and inches, then you’ve used an Imperial template to start with. You’ll then have to add a new scale factor of drawing scale 1 to paper scale 50, etc. You can then lock the view-port window so that you don’t knock out the scale by accident later – click the small padlock icon on the bottom right. Then double-click outside the VP window in order to edit the title block. You can also copy & paste your company’s logo here. Next go to the top left Application menu (Mac: File menu) and choose Print > Plot. Again, a good template file will have the printing specs set up. If not choose any PDF creator in the Printer section, for example DWG to PDF, or Adobe PDF. Click Preview on the bottom left to view. You may need to cancel out of this in order to adjust the X and Y values on the bottom left – this will adjust the drawing’s position on the page. In the section marked Plot Style choose None to print the colours as you see them on the screen. Alternatively you can choose Grayscale or Monochrome. Hit OK to save the file in a location of your choice. The drawing should then open up in a PDF reader (for example Adobe Reader or Adobe Acrobat). If not, browse to its location and right-click > Open With > and choose your PDF reader. This will become the default program for opening PDFs. In Autocad these are created by projecting guide lines from the floor plan – in exactly the same way as you would do on paper – and drawing the front, side elevations and cross-sections by hand. There is no magical tool for this! Other AutoDesk programs, like Revit, have different methods.